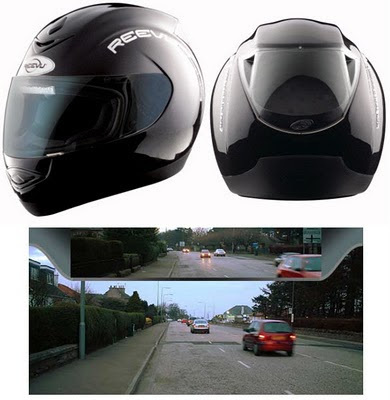 This seems like an obviously good thing: a motorcycle helmet from Reevu that provides the same kind of rear-view-mirror experience as a car, just off-sight enough to be out of the way but keep your attention if something's there. 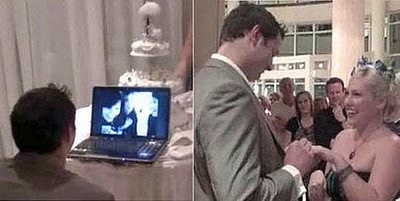 And since it was on Engadget, I assumed it was electronic, using a camera and a small LCD. But no! It's all mechanical - more like an old-school periscope than the rear-view cameras found in luxury SUVs. And somehow, that just makes it even better - robust, pure, no batteries required. And, of course, safe - and very, very useful! It's been a while since I've posted on "upcycling," so here's a refresher: upcycling is reusing something in a way that increases its value - like repurposing packaging as a useful product, such as a lamp, speaker, or TV stand. 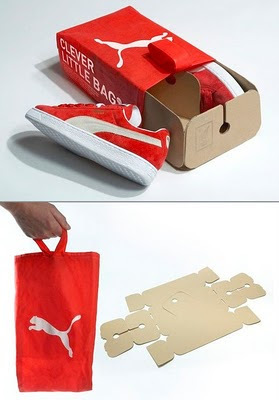 It's an admirable form of recycling, since most recycling is actually "downcycling," where the material is degraded in value until it eventually becomes waste. 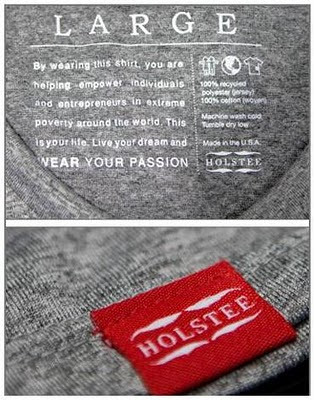 Aaaanyway, I was recently contacted by Dave Radparvar, co-founder of Holstee, which does some pretty impressive upcycling in the fashion world. They use two methods: first, they produce their own shirts out of upcycled polyester, making fashionable fabric out of post-consumer bottles and industrial scrap. (These shirts also feature a uniquely-placed pocket, which I'd have to use firsthand before I could even take a stab at a usability verdict.) Second, they recover what they might call "fast fashion" t-shirts and grace them with custom silkscreens - which intentionally give the formerly gauche shirts an ironic twist, thereby upping their hipster cred and cash value. That's some pretty clever fashion alchemy - and a slick new method of upcycling! This is an old post on Gizmodo - at almost two years old, positively ancient in the tech-news world - but still quite true: John Mahoney explains why it's safer than ever to buy first-generation hardware. He's right, and there are a few reasons that especially ring true: first, he states that "manufacturing is getting really good" - and I'd venture to say that there's a reason. Specifically, hardware is becoming less of modern products' unique value proposition: every phone is pretty much a touchscreen and a battery, with similar internal guts. So, manufacturers are getting better at making those components - and not much even changes from one revision to the other. 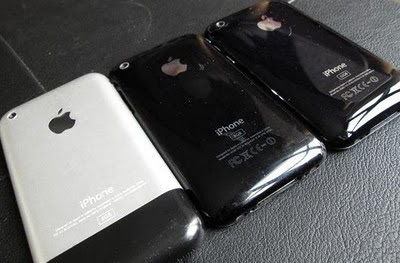 Look at the first three iPhones, for example - the display and touchscreen have hardly changed at all, and the form factor of the whole thing is identical from 3G to 3GS. Second in this gospel according to John, "software updates are more powerful than ever." So, so true - these days, software is pretty much the whole product. Buy a device from a company with a reputation of making their updates free, and you're safely aboard for a whole ride of improvements. Finally - and I love this point - "Internet bitching is a powerful force." If something's wrong with the product, the collective feedback of users will persuade the company to change it - and with that previously-mentioned software update, you won't even need to buy a new one! I'm a big fan of Skype. I use it frequently to telecommute, with two-way video to "be there" in the room, and screen-sharing to collaborate on work. Still, even a Skypophile like me has to wonder whether it would work for a wedding - and sure enough, it was used for one just a while ago. A couple stranded by the volcanic-ash flight disruptions wasn't able to make it home to Britain for their wedding, so they phoned it in - they set up a video link back to their friends and family, and tied the knot remotely. It makes me think: what does it mean to "be there?" If you can see their faces and share the joy, but not hug'em (and drink their booze), does it count? I don't know the answer - but I know it'll only be a more and more relevant question! Defaults - Almost more important than the option! Designers constantly weigh the comparative advantages of offering the user a changeable setting (which increases complexity but makes products more personalized) or a static design (which makes the product simple but offers no choices). Power users, like myself, crave options: our first instinct is to dive in to any product and see what we can tweak or change to our particular preferences. But newer user need the simplicity of a product where the decisions have been made for you, in (what the designers believe is) your best interest. However, lost in this dichotomy is the in-between design choice: the default. If you design an option, the default setting for that option is almost even more important than having made it an option at all! Defaults, writes Kevin Kelly, are "sticky" - most never get changed. So consider them carefully: what's best for the user (a default 4% contribution to your IRA), what's safest (default traction control "on" in cars), what's most private (location awareness "off" on phones)? Defaults can make or break the user experience as much as any other design choice! 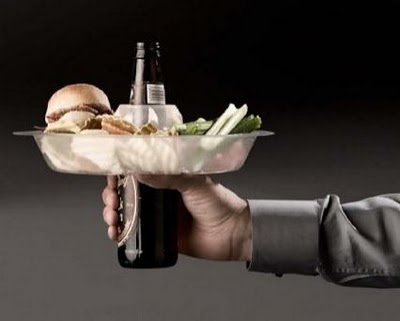 The Go Plate. Yes, the Go Plate. Need I saw more? About a buck a piece, at Amazon. 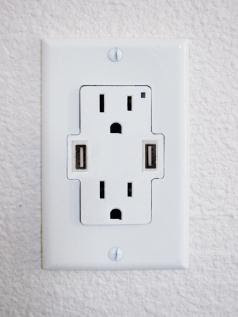 AC-and-USB Socket - One socket to charge them all! From college buddy Barry Simon, here's a wall socket for the mobile/digital age. 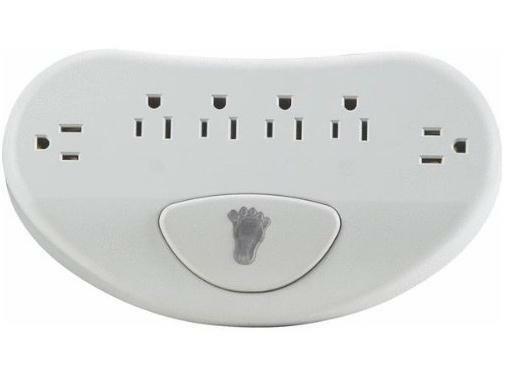 It adds some USB power to the AC standard, which spares you a wall wart in the right situations. And with USB fast becoming a standard for mobile power - see here, and here - I, for one, welcome our new 5-volt overlords! A lot of energy savings can be accomplished with convenient and usable ways to power off devices when they're not in use - and here's one more for your consideration. Woods Industries makes a power strip with a simple foot switch, available at Amazon for a totally reasonable $13.19, that may make sense for a lot of users. Imagine stashing this sucker under your desk, and using it for your monitor, speakers, printer, lamp, scanner, and whatever else. When you get up to leave, give it a tap, and enjoy saving the planet a little bit! Not bad, not bad at all. Samsung is making a risky move with their latest camcorders, like the SMX-C20UN - no, not the naming (which is its own problem), but the angle of the lens. Instead of pointing straight forward like camcorders of the last 25 years, it's tilted up 45ish degrees. 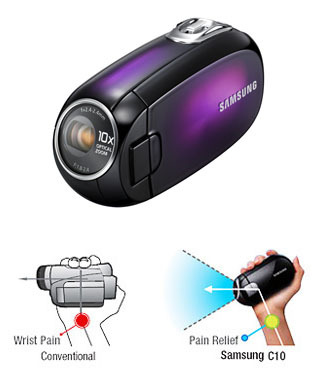 Samsung claims, correctly and with the help of diagrams, that this lets the wrist stay in a more comfortable and natural position during filming. I mean, who can argue with those labels saying "Wrist Pain" (!) and "Pain Relief"? The only downside is the downward shot you seem to be taking all the time. Face it, you look like you're recording everyone's footwear for posterity. The casual videographer is still a part of the social ecosystem, after all, and if things don't look right it can throw a wrench into the works. I can only imagine how much footage these cameras will take of subjects asking, "Are you getting me in the shot? Why are you looking at my feet? I'm up here!" With the mainstreaming of ebook readers like the Kindle, Nook, and iPad, both Gizmodo blogger John Herman and New York Times writer Motoko Rich are calling attention to the the loss of book covers - and what that means to the reading ecosystem. 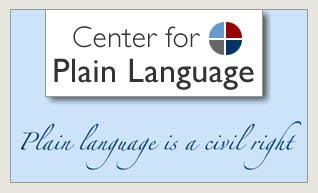 Specifically, we can anticipate two big changes: first, book covers provide the publisher and author with silent word-of-mouth (er, sight-of-eye?) publicity, when people see strangers reading books in airports, on trains, and so on. See the same book a couple of times in that kind of situation, and you're likely to take an interest in it yourself. Second, seeing a book you have read can start a social interaction - it's an icebreaker to mention to the reader how much you loved it, or ask how they're enjoying it. 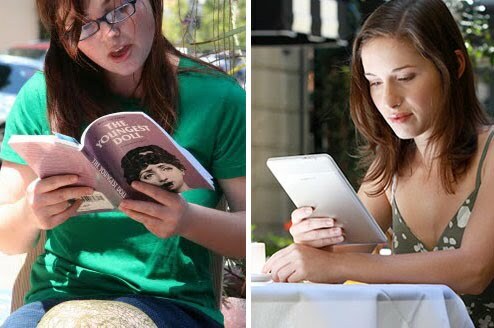 With ebook readers, both of these phenomena go away - unless you're looking closely over the reader's shoulder, the only thing you'll see is an Apple or Amazon logo on the back of the reading device. So, do we really need these two things we're about to lose? Probably not - but they're worth considering as part of the cost of the change. 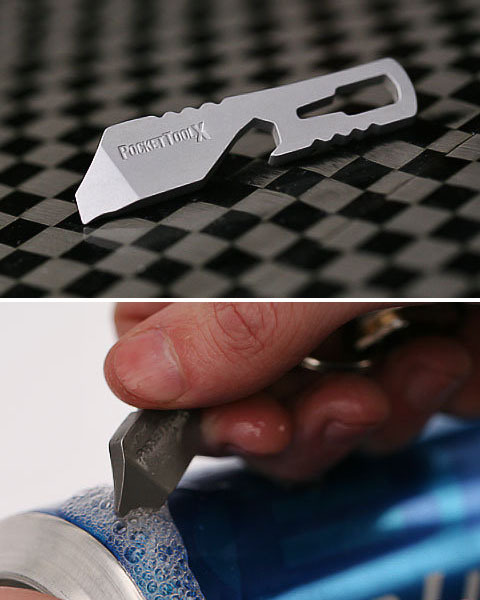 Sent my way by good buddy Matthew Chun, the PocketToolX Brewser is, in many ways, a normal pocket multitool. It's got the expected screwdrivers, pry tool, scraper, bottle opener, and blade. But as the name and beer-bottle silhouette suggest, it's got a little more: the tip is designed to shotgun beers. As someone who found it much more difficult than I expected to accomplish the same thing with a golf tee (that did not go well) it seems reassuring to have a tool designed specifically for the purpose. For every task, a tool, right?